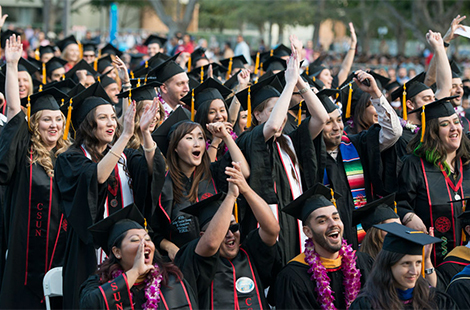 More than 10,600 graduates will walk across the stage during commencement proceedings starting with Honors Convocation on May 15 and concluding on May 18 with the last of seven ceremonies that will launch these new CSUN alumni to new heights. Read more about Commencement 2015. From starting out as a fresh-faced production assistant to taking on major duties on the Emmy-winning Mad Men, John Hampian talks about his journey from CSUN’s CTVA program to working on one of the most acclaimed shows on television. Read more about John Hampian’s journey. CSUN’s best student designers showed off their work at the 36th annual TRENDS Fashion Show. The winner's work will be displayed at Bloomingdale’s. Read more about TRENDS. Thu., May 7, 7 p.m. Thu., May 14, 7:30 p.m. Sat., May 23, 1 p.m.
As CSUN prepares to “Clear The Air” and become a smoke- and tobacco-free campus on Aug. 19, we want to ensure that faculty and staff who wish to adopt a nonsmoking lifestyle are aware of the resources available. Join us May 7, to learn about the resources available through the Klotz Student Health Center and CSUN’s Human Resources Department. Stop by the Colleagues Room to sign a banner congratulating our 2015 graduates and wishing them well. The CSUN community will come together to celebrate those faculty members whose stars have shone the brightest and longest at the university’s Honored Faculty Reception.